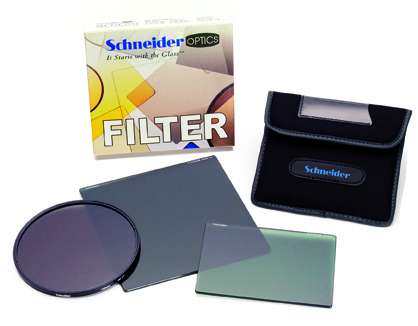 Schneider Optics is proud to announce it will receive a Technology and Engineering Emmy® Award, for its IRND (Infrared Neutral Density) filter technology, from The National Academy of Television Arts & Sciences (NATAS) on 10 January 2013 at the Consumer Electronics Show in Las Vegas. The National Academy presents Technology and Engineering Emmys "to honor technology companies and individuals whose innovation and vision have materially affected the way the audience views television and have set the standard for technological excellence in the industry," said Robert P. Seidel, Vice President of CBS Engineering and Advanced Technology and chairman of the award committee. Schneider developed its IRND technology to address a critical problem with high-definition digital cameras. Cinematographers have found that the sensors in these cameras have a high sensitivity to light just beyond the visible range into the infrared. This can be beneficial in extending the color gamut of digital cameras to closely approach that of traditional film. However, light in the IR spectrum can also cause unwanted false color shifts and prevent the camera's imagers from capturing true black tones. "In keeping with our ongoing goal of providing cinematographers with the imaging tools they need, our engineering team crafted a solution by designing the Platinum Series IRND filters. These provide the proper balance of light striking the camera's CCD or CMOS imager throughout the spectrum," said Dwight Lindsey, CEO of Schneider Optics, Inc. Carefully calculating the optimum cutoff frequency, measured in nanometers, and precisely controlling the manufacturing process, Schneider has been able to produce a near-infrared cut filter that lets users of HD cameras get the most out of their camera gear. This means the benefit of an extended color gamut without the worry of unwanted false colors. Eliminating the near-infrared light leakage lets the camera maintain true color rendition in the blacks while maintaining high MTF of its lenses and camera system. Platinum Series IRND filters are free of off-axis color shift regardless of the focal length and can be stacked without introducing reflections. They can also be used as a standard ND filter with all HD video and film cameras. Schneider offers these filters in all standard video and cine sizes, including: 4×4, 4×5.65, 5×5, 5.65×5.65, 6.6×6.6 sizes plus rounds in 138mm, 4.5" and Series 9. Platinum Series IRND filters are available in 0.3, 0.6, 0.9, 1.2, 1.5, 1.8, and 2.1 densities.